Classic meets contemporary in Sunpan’s Miriam Dresser, a creative mixed-media combination of clean-lined design complemented by a subtly rugged rustic finish. 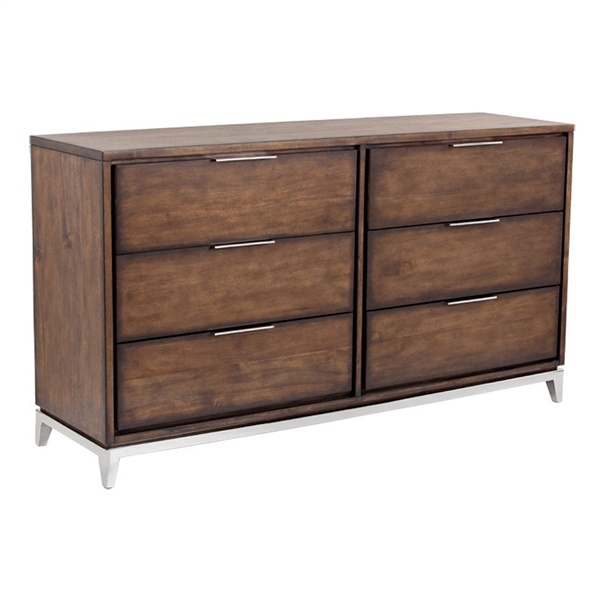 Featuring six generous drawers, each accented by the gleaming sheen of sleek stainless steel, the Miriam Dresser by Sunpan offers versatile storage style on its own or arranged with Sunpan’s other Miriam pieces. Smoked brown finish will complement the décor in a modern or traditional setting. Stainless steel handles and base add a touch of glamour to any setting's décor. Offers six drawers for plenty of storage space. Spacious top makes it easy to display photographs and much more.